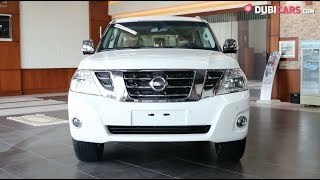 New 2019 Nissan Patrol Platinum for sale in Abu Dhabi. Available from Motor World Showroom and comes with warranty. Automatic transmission, 6 cylinder engine, 20″ wheels and tan interior. Car has GCC specification.